Sleeve Striped Black Blazer with Chain. Refine your streetwear with this mens striped black blazer featuring tonal sleeve stripes and removable metal chain. 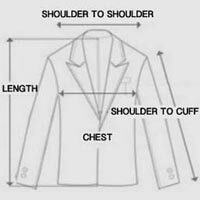 Fitted blazer has traditional notched lapels framing the neck and a single jacket vent on back. Front of jacket detailed with a single-button closure, chest pocket with attached handkerchief, and two flap pockets. Long sleeves are accented with a matte black stripe and decorative cuff buttons. Fully lined, striped interior includes two welt pockets concealed along interior of jacket opening. You can wear this as a casual blazer with chain accessory or leave out the chain to keep it minimal. Whether you’re dressing it up or down, this sleeve striped black blazer for men will always look sharp. Model is wearing size M (50). Sizes are measured in inches. For accurate measurements, check the table below.